Some homes don't have the space necessary for a ramp. The wheel chair lift is a safe and simple solution for small yard space and the need to easily climb the porch. Let us see if a wheel chair lift is right for you. With the introduction of the new Vertical Platform Lift (VPL-3100), Bruno Independent Living Aids has broadened the Accessibility Division’s product line in a new direction – straight up! 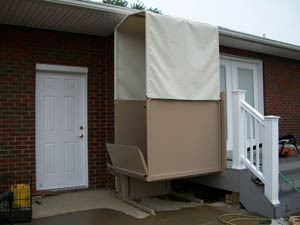 Designed and built by Bruno’s master craftsmen, the Vertical Platform Lift provides a rugged, reliable and affordable solution for individuals and caregivers who need assisted access to a porch or deck. * Bruno offers added peace of mind with our new battery powered Vertical Platform Lift. * Your life doesn’t stop when the power goes out – now your VPL doesn’t have to stop either! * Our battery powered VPL provides access in and out of your home even during a power outage.